Between 1960 and 2008, only a dozen or so middle-income countries became prosperous. This column explores the factors affecting how and why some countries become prosperous, while others fail. Consistent with the theories of New Institutional Economics, economies that adopted the economic policies and institutional reforms of successful countries enjoyed the largest increases in prosperity. These successes point to the advantages of looking beyond the economic staples of capital, labour, and technology in fashioning growth policies. 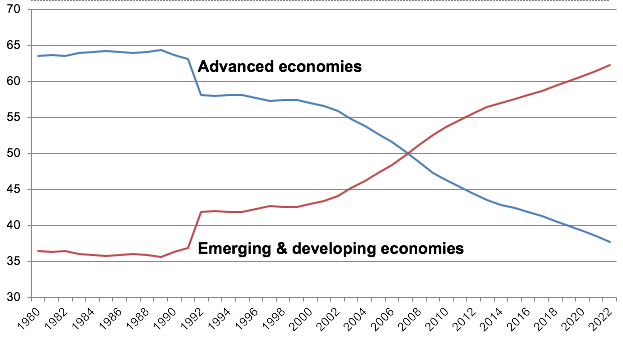 Emerging and developing economies for the first time account for a larger share of world GDP or global output than developed economies; a point surpassed after the 2008 financial crisis that has continued apace (see Figure 1). Does that mean that economists have found the key to prosperity? First, less than a quarter of the world’s economies are rich. It’s a long-standing economic question as to why more countries are not prosperous. The tide is now turning. Still, it has been difficult for countries to become rich. The World Bank estimates that of the 101 middle-income economies in 1960, just a dozen or so had become prosperous by 2008 (Ageno et al. 2012): Equatorial Guinea, Greece, Hong Kong SAR (China), Ireland, Israel, Japan, Mauritius, Portugal, Puerto Rico, South Korea, Singapore, Spain, and Taiwan. Source: IMF. Based on PPP (purchasing power parity). But, hundreds of millions of people have joined the middle classes. There are more successes now than ever before. Research by the OECD estimates that by 2030, for the first time in history, more than half of the world’s population will be middle class (OECD 2012). That’s 4.9 billion out of an estimated 8.6 billion people. In 2009 1.8 billion (out of around 7 billion) people earned between $10 and $100 per day, a measure of the income that defines the new global middle class. That’s enough to buy a refrigerator, adjusted for what a dollar buys in their countries. Based on current trends, in 2030 around two-thirds of the middle classes worldwide – nearly 3 billion people – will be in Asia. The UN describes it as a historic shift not seen for 150 years (Yueh 2018). The European and North American middle classes will fall from more than half of that class’s world total to one-third. How has this been achieved? Possessing good institutions is what economists have come to focus on and the spread of such institutions seems to have been key, as the father of New Institutional Economics predicted. The seminal work in this area was by Douglass North who was frustrated by neoclassical economic models that focused on measurable factors like workers and investment, with attempts to measuring technological progress, even though they could not fully explain why some economies grow well and others do not. So, North took economics out of its comfort zone, which consisted of examining more easily measured inputs like labour and capital, and instead brought in politics, psychology, and strategy, as well as history, in order to understand why some countries succeed and others fail. He stressed that there was no reason why countries could not learn from more successful economies to better their own institutions. That finally happened in the 1990s. In the early 1990s, China, India, and Eastern Europe changed course. China and India re-oriented their economies outward to integrate with the world economy, while Eastern Europe shed the old communist institutions and adopted market economies. In other words, having tried central planning (in China and the former Soviet Union) and import substitution industrialisation (in India), these economies abandoned their old approaches and adopted as well as adapted the economic policies of more successful economies. For instance, China, which has accounted for the bulk of poverty reduction since 1990, undertook an ‘open door’ policy that sought to integrate into global production chains which increased competition into its economy that had been dominated by state-owned enterprises. India likewise abandoned its previous protectionist policies and embraced exports to a greater extent. The wholesale transformation of the economic system was of course in Central and Eastern Europe. Communism gave way to capitalism, with these nations adopting entirely new institutions that re-geared their economies toward the market and many joining the EU. Thus, the 1990s witnessed the rapid growth of emerging economies whose growth via industrialisation eventually led to an extraordinary commodity super-cycle due to their voracious demand for raw materials to fuel their development. As many of these economies, especially China, have become middle-income countries, their economic growth is slowing down. And they may slow down so far that they never become rich. But, their collective growth has lifted a billion people of out of extreme poverty, and the UN hopes that their continued growth will lead to the end of abject poverty in the next decade or so, which would be a historic achievement. That would realise the first of the Sustainable Development Goals adopted by every nation around the world to end extreme poverty – i.e. those earning less than $1.90 per day adjusted for what a dollar buys in their country – by 2030. This sort of imitation of good institutions and effective economic policies was as outlined by institutional economists such as Douglass North. It took the fall of the Berlin Wall, the rescue of India by the IMF in 1991 as well as China’s re-orientation towards the global economy in 1992 for these economies to look to adopt a new course. By emulating ‘best practice’ in other economies as well as opening up, which meant learning from more successful foreign companies, these countries have made tremendous progress as North would have expected. He would have approved of these economies looking more widely than just on capital or labour or technology in fashioning their growth policies. North once remarked: “My pet peeve all through the last twenty years or thirty years has been the narrowness of economists, in fact of all social scientists, in not opening up whole new areas” (North et al. 2015: 9). And his ideas have brought us closer than ever before to answering the age-old question of how countries can become rich. Agenor, P-R, O Canuto and M Jelenic (2012), “Avoiding middle-income growth traps,” Economic Premise 98: 1. North, D C, G Brown and D Lueck (2015), “A conversation with Douglass North,” Annual Review of Resource Economics 7: 8–9. Pezzini, M (2012), “An emerging middle class,” OECD Observer. Yueh, L (2018), The Great Economists: How Their Ideas Can Help Us Today, London: Viking.